You can see that although the words differ, it’s basically the same story. 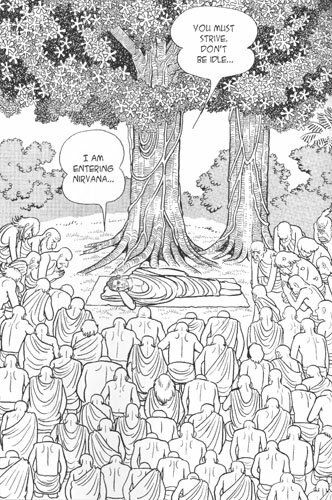 There’s a bit of elaboration — for example in the original we’re not exactly told what Akkosaka Bharadvaja said to the Buddha, just that it’s insulting, while in the retelling we’re given details, such as the Buddha’s “a fake” — but essentially there’s no difference in the message being conveyed. Now words are being put in the Buddha’s mouth. Would I consider the Facebook parable to be unacceptable? Actually, I wouldn’t. When you’re teaching, or just talking to someone, and you want to use an illustration from the Buddhist scriptures, you can’t be expected to have memorized the stories word for word, or to say “Wait till I run home and grab my copy of the Majjhima Nikaya!” You just tell the story, in your own words. Sometimes you’ll do it well, sometimes you’ll make a mess of it. But at least it’s an honest attempt at conveying a story. You’re putting words into the mouth of the Buddha, but as a dramatic technique, and it’s generally obvious you’re not making claim that the Buddha said the exact words you’ve ascribed to him. There’s the Buddha of the Pali canon, and there’s the Buddha of your imagination. It seems to me that both are valid, and that you simply have to be careful not to mix them up. Mixing up these two Buddhas often happens when these dramatizations of the suttas are put into writing, though. Those who aren’t familiar with the Buddhist scriptures may take something like the Facebook parable above to be canonical, and then extract the Buddha’s words as a standalone quote. Now, attributed to “The Buddha” the quote will be taken by others to be canonical, and so a Fake Buddha Quote is born. Part of the problem is that often the Buddha of the imagination is more interesting than the Buddha of the canon! His language is generally more contemporary and pithy — just compare the length of the two versions above, and also see which one feels better to read. Now I’m not saying it’s bad to paraphrase the suttas because the paraphrase might be taken out of context and presented as canonical. That would be absurdly cautious. In fact I think it’s good, in the contexts of talks, and even in books, to bring the suttas to life by dramatizing them. When Jonathan Landaw wrote “The Story of Buddha,” from where the Facebook parable comes, I’m sure he had no notion of “faking” anything or of trying to pass off his own words as the Buddha’s. Why am I writing all this? I’m really just clarifying in my own mind the limits of what I consider to be acceptable. On the one hand we might have the example someone finding an anonymous quote lying around and deciding to attribute it to be Buddha for whatever reason. This seems to happen a lot, and is something that I don’t find at all acceptable. Even more extreme, I suspect some people just make up some spiritual-sounding saying and try to pass it off as the Buddha’s words. Also unacceptable. On the other hand we have this more innocent sort of “retelling” of a story from the canon, and I think it’s fine. No misrepresentation is being intended, and if sometimes others might turn these stories into Fake Buddha Quotes it’s they who are at fault, not the original author. PS. I’ve done this myself, and I’ll write up a full confession at some point. When the story or sutra becomes your truth , you then convey it in your own words in a situation its your own and not fake. That’s basically what I’m saying (although the concept of “your truth” is alien to me. The problem arises when people think that scriptural stories that are passed on as anecdotes are taken as actual quotations, which happens quite a lot.